[caption id="attachment_365" align="aligncenter" caption="Elmhirst Resort's snow kite weekend will be held January 29-31, 2010."] [/caption] I've had a fascination with Rice Lake since moving to Ontario. An hour and a half drive northeast from Toronto, it's a big, shallow lake known for its fishing, historic resorts and cottage communities. The lake got its name for wild rice that once grew here. It was a major food source for local Ojibwa who harvested it every year. The Trent Severn Waterway, a one hundred year old system of locks stretching from Lake Ontario to Lake Simcoe, raised the water levels on the lake and what little remains of the wild rice today gets eaten by birds. Elmhirst's Resort is on the north side of the Lake, 1/2 hour from the Ontario city of Peterborough. Every time I've visited this resort, I've come away with a good story. My first visit was years ago. I was with an Irish tv producer. He was scouting Ontario locations for a popular Irish travel show. I still remember the two of us strapping ourselves into the backseat of an Elmhirst float plane. The pilot started the plane's engine and eventually shifted the joystick into full throttle. It was a windy day and we bounced across the waves and then suddenly we were airborne, flying just above the treetops. I remember having my elbow out the plane window just like in a car and counting all the osprey nests . The Irish tv producer and I were like two kids in a candy store. His one wish for Canada had been a ride in a float plane and here we were chasing his dream. It was fantastic fun. Just before beginning this post, I checked the Elmhirst blog and sure enough, float plane rides are as popular as ever. In winter, the floats are replaced with skis. Now, that would be something to try- taking off and landing in a plane fitted with skis. Elmhirst also has a private airstrip that attracts pilots from all over, including Swiss pilot Hansreudi Aeschbach who flew in for his 68th visit this past summer. [caption id="attachment_367" align="alignright" caption="Fishing off the dock"] [/caption] On another trip to Elmhirst's Resort, I was with my husband. We arrived on a beautiful June evening. The late day sun had cast a golden glow over the shoreline and I remember seeing all this movement on the water's surface in front of our cottage. I had no idea what could make such a commotion, so when we were later dining at the main lodge, I asked. They're massive Carp I was told. And what's more, they're a popular catch with the UK sportfishing crowd. Many come with their families to try their luck at snagging a big one. But it's not the only fish you'll find in Rice Lake. Bass fishing is big here too, so is Walleye (pickerel) and check out this Muskie caught by an Elmhirst visitor just last week. [caption id="attachment_370" align="aligncenter" caption="The million-dollar wine cellar"] [/caption] Last winter, I was back at Elmhirst with a food writer and an event planner from a big Canadian travel media association. I'd never been to the resort in winter and I was impressed with the amount of snow they had. It was a beautiful, crisp evening. The stars were out as we made our way from the main lodge to the resort's million dollar all-Canadian wine cellar. There we enjoyed some great vintages paired with tasty hors d'oeuvres made by chef de cuisine, Michael Sterpin. They're serious about their food here and as local as you can get. Much of the menu is produced at the Elmhirst farm on site, including fresh eggs, Elmhirst's Own corn-finished Black Angus beef, turkey, vegetables and herbs. Preserving is big too. I noticed jars of preserves lining the wall of the dining room entrance as we went in for dinner. All eight of us couldn't resist ordering the house specialty; steak and frites. And when it came to dessert most of us couldn't pass up the chance to try the wild rice pudding first concocted by the Elmhirst family's 91 year old matriarch. 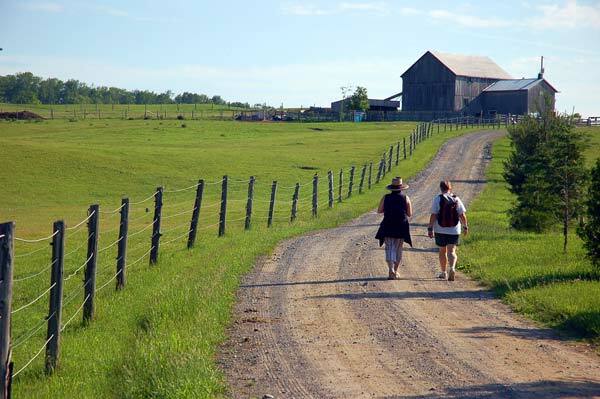 [caption id="attachment_368" align="aligncenter" caption="Morning walk up to the farm at Elmhirst Resort"] [/caption] There's also an intriguing story that ties the resort and the area to Lord Nelson. In 1818, long before Canada was a country, King George IV of England awarded 1000 acres on the north shore of Rice Lake to Phillip James Elmhirst. Elmhirst had been a lieutenant in the Royal Navy and had fought for Nelson at the Battle of Trafalgar. Fast forward to 1906 when the grandfather of present owner, Peter Elmhirst, acquired the "Walker Farm", a 340 acre parcel of land on the north shore with a mile of scenic shoreline. This is the present day site of Elmhirst's Resort. There's plenty to do here. Riding stables and trails are on site. In winter, old-fashioned sleigh rides are popular. 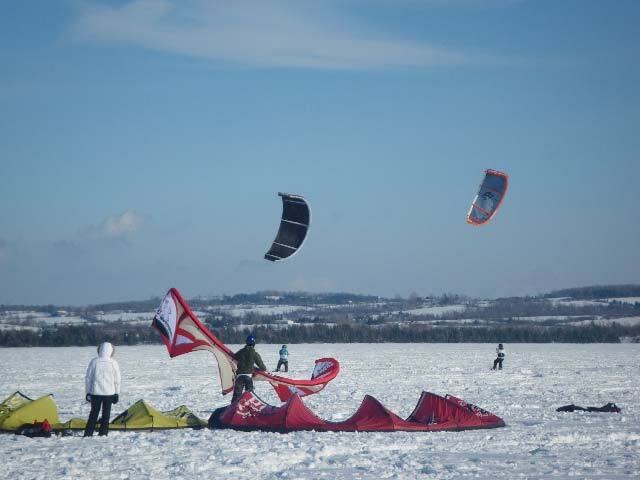 Elmhirst also hosts an annual snow kite festival out on the frozen lake. Picture surfboards attached to massive kites skidding across the ice. There's also cross country skiing and tobogganing and the resort hopes to offer icefishing this winter. And to soothe tired muscles after a day of outdoor fun, there's always the hot tub, sauna and indoor pool. Modern cottage accommodation ranges from one to five bedrooms and all the cottages have fully equipped kitchens, woodburning fireplaces, jacuzzi tubs, television, internet and VCRs. [caption id="attachment_382" align="aligncenter" caption="The cottages are cozy in winter."] [/caption] Watch for great winter deals here. A popular package with Elmhirst guests is the Couch Potato getaway . Priced at $399 per couple mid week, breakfasts and dinners are included. The weekend version has Saturday breakfast and dinner and Sunday Brunch and is $429 per couple. Taxes are not included with either rate. 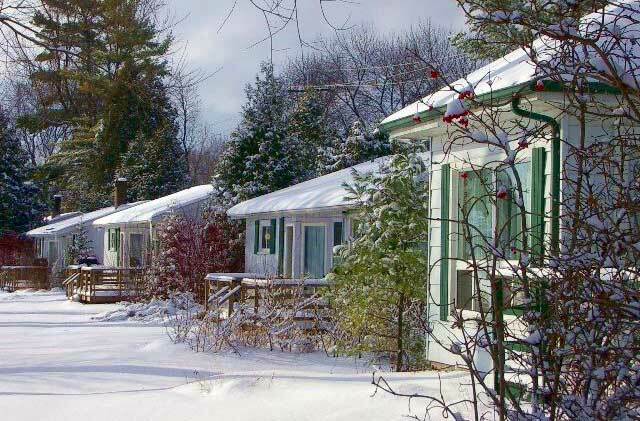 Many of the more than one hundred Resorts of Ontario across the province are open all winter and offer seasonal mid week and weekend deals for couples, families and small groups of friends.